If you are like us and you are still on the glitter kick, you will enjoy these Glittered Heel Booties. These are black Nine West booties we found in a thrift store for $5.00. They were beautiful already but why not update them with some glitter and a thick ribbon as the shoelace? 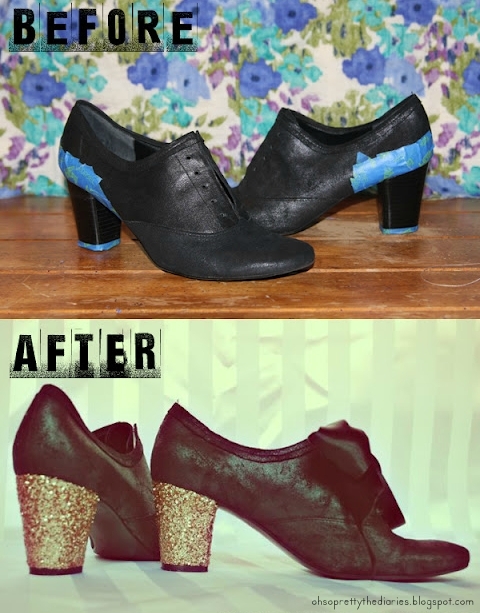 We used the same method as we did in the "DIY: Glitter Shoes" post but, only on the heel. We laced the shoe with some 2 inch thick black ribbon so we could form a giant bow on top of the shoe and Voila! Your very own unique pair of Nine West oxford booties.